While there has been substantial developments around utilization of Data Science and Analytics based solutions for business effectiveness and strategy, most of it was revolving around sectors such as Retail, Banking and Insurance. In recent times, it has been finding inroads into the manufacturing industry. 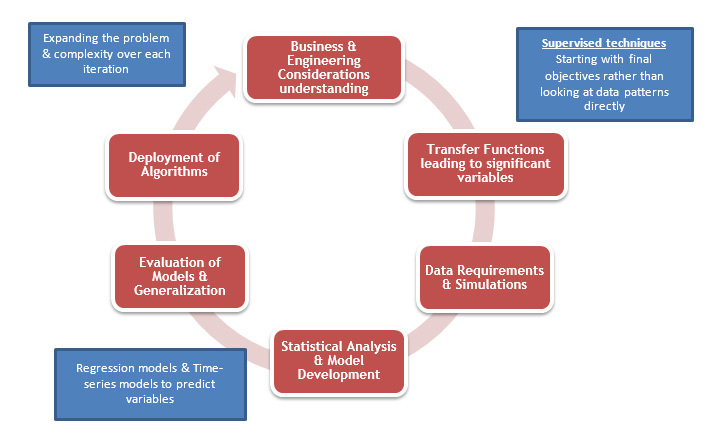 Advanced data science and analytics applied to the manufacturing Industries, differs in various features wherein the business aspects need to be tweaked as per the specific industry dynamics rather than generalized business areas. Some of the areas within manufacturing such as fleet analytics, aftermarket optimization are generic and have found common solutions across sub-industries. However, the field of sensor analytics has seemed elusive owing to its heavy dependence on domain specific approach. Traditionally, a very scientific approach has been used to address this challenge and results haven’t always been up to the expectations. It is in this aspect experts have developed a new hybrid model to lead to quick and significant business impacting results. The purpose is to highlight this radical new approach and reiterate the usefulness. Here, focusing about the manufacturing industry with emphasis on how sensors can help companies to create a smart factory with effort on optimized output, reduced loss, safer works environment and meet compliance standards. The biggest part of creating a smart factory is implementing sensors and sensor connectivity. Sensors plugged into the right places along the production floor can give factory supervisors valuable data in real-time and help them take control of processes that exceed predefined parameters and shut them down. The alerts can be sent to the desktop in the controller’s cabin or on his smartphone so that he has access to the information from anywhere. Sensors are used in multiple places today for purposes like remote monitoring, automated control, FMEA and automated alerts. The type of sensors and their placement also vary significantly from sensors installed in an airline black box or an ECU (Electronic Control Unit) fitted in a car to an industrial sensor fitted in manufacturing plant for monitoring operating parameters. A lot of organizations still utilize the traditional systems for data collection and monitoring. In essence a lot of these systems are offline where the data is collected at a plant and analysed locally. A lot of plants still utilize the good judgment of experienced technicians to understand and resolve the problems. A lot of times these systems aren’t up to the mark and the technicians either rely on traditional manual techniques for measurement and analysis or come up with some work around to quick fix challenges. With technological advancements such as High Speed Data Logging, Big Data Frameworks and Advanced Analytics, a lot of organizations are seeking to centralize the collection and monitoring of sensor data. A typical Remote Diagnostics System would have architecture is shown in Figure – 1 below. In this case, though we have shown a box for Big Data Architecture, most of the systems currently in place are in the process of modernizing their architecture. More commonly an Operational Historian System is used. 1. Conversion Factors – Different geographical regions utilize different conventions and units of measurement. A common code is needed to translate all to a standard format for storage and retrieval. 2. Sensor Errors – Sensors add in erroneous data occasionally. This either needs to be corrected or some unwanted data needs to be removed. Uncorrected errors wreak havoc in Analytical models. 3. High Speed Data Capture – A lot of sensors produce real time data. Some sampling mechanism is needed to chop this data into readings without loss of critical information. Monitoring effectiveness is improved with smaller sampling intervals. However, a cost-benefit analysis is needed before going for a near real-time system. 4. Handling large data size and load – Most traditional systems are currently facing challenges with increased access and processing time. They were designed to handle moderate loads. 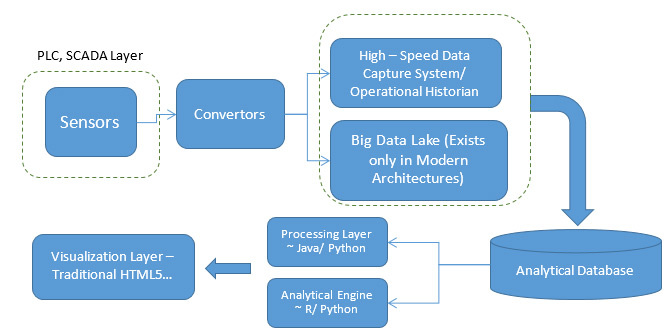 With a plethora of sensors being added and sampling intervals being reduced have led to the need for utilizing a Big Data Lake to streamline & speed up monitoring and analytics. 5. Data Reduction & Cleaning for Analytics – This is specific to the analytics project and substantial of time is spent in this activity on the analytics front. Unlike other domains, there is a lot of dependence on Domain specific info while data cleaning and reduction. Unlike typical analytics projects, Sensor analytics needs an iterative hybrid approach. Rather than starting by looking at data directly, a considerable amount of time needs to be spent in understanding the domain and specific business problems that the project is seeking to solve. Figure below shows the iterative hybrid approach. In essence, begin with a small problem and utilize physics based design considerations and transfer functions to arrive at significant variables to further drill-down to. Often some of the variables need to be derived from the primary data captured using governing equations of physics and mechanics. Occasionally a few variables need to be simulated or corrected before they can be utilized further. As in all data science projects, this is followed by extensive data cleaning and organizing them. Analytical models are then applied over clean data to arrive at specific parameters such as remaining useful life of an asset. These models are to be piloted over multiple assets to verify their general applicability. A generalizing factor might also be added to reduce over - fitting. Finally, the model is built into the system as a parameter or visualization and the iterative process then moves on to other business problems or enhancing the solution by adding more variables and complexity.